What legal principles govern the external exercise of the public power of states within common law legal systems? Foreign Relations Law tackles three fundamental issues: the distribution of the foreign relations power between the organs of government; the impact of the foreign relations power on individual rights; and the treatment of the foreign state within the municipal legal system. 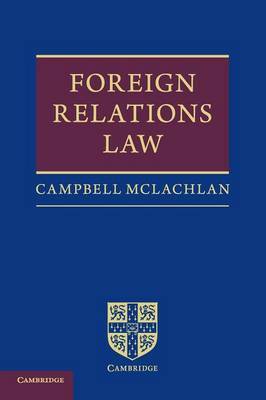 Focusing on the four Anglo-Commonwealth states (the United Kingdom, Australia, Canada and New Zealand), McLachlan examines the interaction between public international law and national law and demonstrates that the prime function of foreign relations law is not to exclude foreign affairs from legal regulation, but to allocate jurisdiction and determine applicable law in cases involving the external exercise of the public power of states: between the organs of the state; amongst the national legal systems of different states; and between the national and the international legal systems.